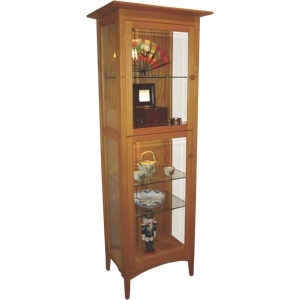 Image showing off all of your prized glass wear or other special treasures in this three sided glass curio cabinet. This cabinet comes with upper and lower compartments with plain or beveled glass doors. Each compartment supports an individual adjustable glass shelf. No Living, Dining room or entry should be without this exquisite curio cabinet. A larger cabinet is available similar in design to the one shown here but with double doors top and bottom. Optionally each compartment can have lighting to show off those treasured pieces.Beveled Glass can be added for additional cost. The piece as shown has beveled glass in the doors. Additional options such as beveled glass and lighting available.